Samson threatened to break down the walls of the ICA. 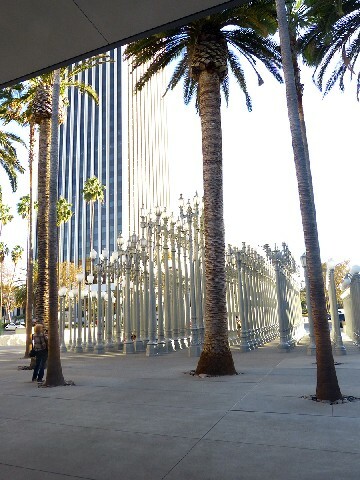 Installation in front of the LA County Museum of Art. 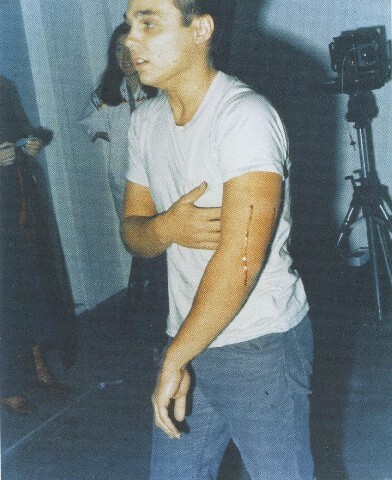 The artist was wounded as the result of Shoot. Burden revving up the giant fly wheel. 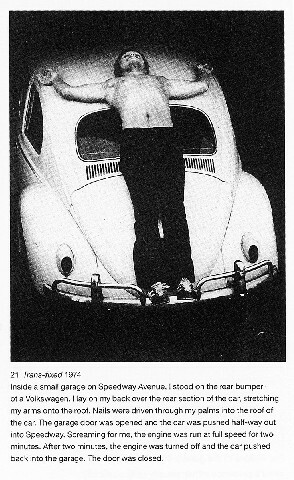 From youthful rebel who had himself shot and nailed to a Volkswagen, to A list artist and tenured professor, Chris Burden is now a memory. A diagnosis of melanoma 18 months ago was known only to intimates until his death at 69. Writing an obituary for one of the most challenging and inventive artists of his era is almost an afterthought. Particularly early on when avant-garde artists generally do their most outrageous work Burden routinely pushed the limits of physical endurance including specific pieces that risked his life. It would be simplistic to say that some of his works were publicity stunts. That was hardly the case as he explained to me during a meeting at Boston's Institute of Contemporary Art on 7/29/89. 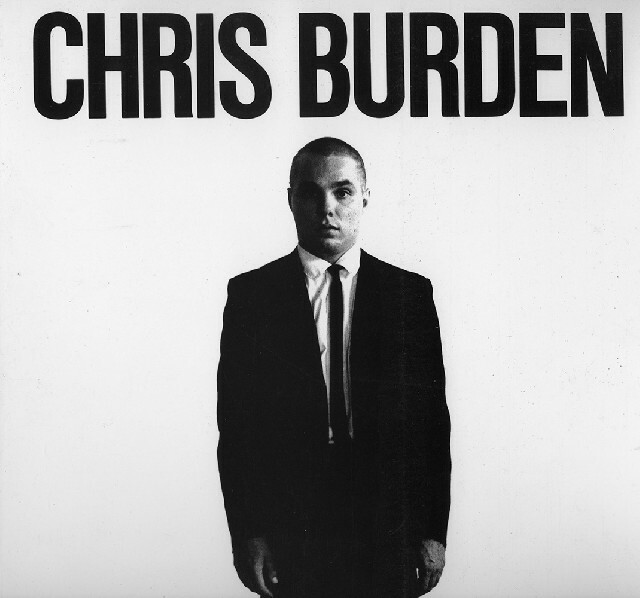 We toured his exhibition "Chris Burden: A Twenty-Year Survey" alone in the galleries before they opened to the public. With a round face, closely cropped hair and a stocky build his appearance was more that of a rugby player than an artist. While open and engaging, answering all questions with an infectious directness, he rarely smiled. There was, however, an ironic humor to many of his works which exposed the absurdest aspects of the global threats of the military industrial establishment. One of his oblique, gonzo strategies in the work "Samson" entailed bringing down the very building that housed his exhibition. 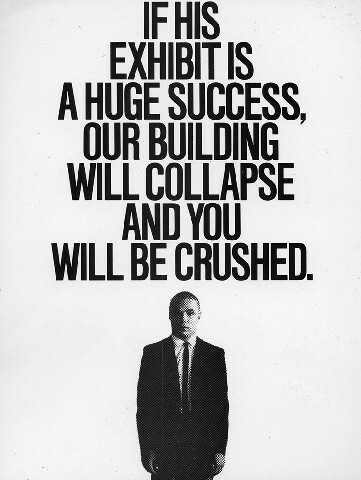 A flyer for the exhibition stated "If his exhibition is a huge success, our building will collapse and you will be crushed." 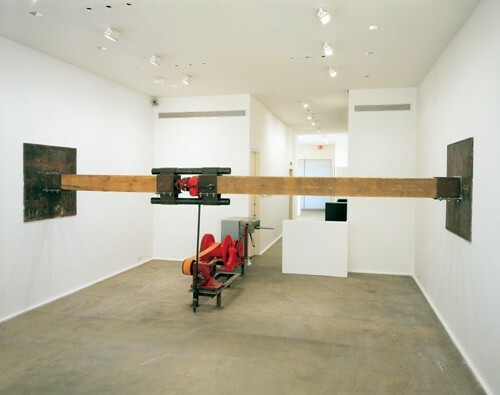 Each visitor moved a turnstile attached to beams extended to the outer walls was turned one notch on a giant jack. While well attended the work was calibrated for that not to happen. But it provided a compelling metaphor of an artist's notion of taking down the museum as a surrogate for the art establishment. On an overblown scale it was like the notion of biting the hand that fed him. 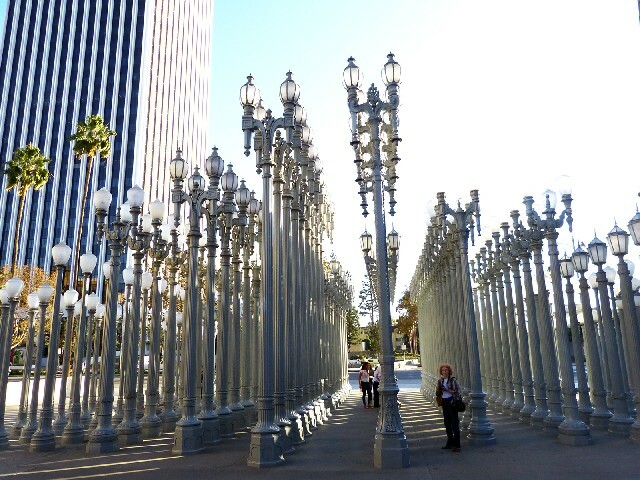 During an October visit to the LA County Museum of Art we viewed "Urban Light, " 2008, an ersatz Classical Greek temple composed of 202 restored, antique, cast-iron street lamps. It has become an endearing landmark in front of the museum. We have seen his works as well as those of his sculptor wife, Nancy Rubins, at Whitney Biennials and other museum exhibitions. It reminded me that by mid career he morphed from edgy performance pieces to conceptual sculptures and eventually large and complex, appropriated, found object, Duchampian, assisted readymades like "Urban Light." From that initial encounter with the understated, straightforward, compellingly sincere and persuasive artist we realized that his work followed parallel trajectories. One stream, which attracted initial shocked attention, was about creating extreme situations in order to experience what it would be like to be shot, crucified or laying down in the street with passing traffic. For "Deadman " he stated "At 8 P.M. I lay down on La Cienega Boulevard and was covered completely with a canvas tarpaulin. Two fifteen-minute flares were placed near me to alert cars. Just before the flares extinguished, a police car arrived. I was arrested and booked for causing a false emergency to be reported. Trial took place in Beverly Hills. After three days of deliberation the jury failed to reach a decision and the judge dismissed the case." For "747" he stated "At about 8 A.M. at a beach near the Los Angeles International Airport, I fired several shots with a pistol at a Boeing 747." Fortunately he was not arrested. Imagine explaining to a jury that the bullet would never reach its target. As with so many of his projects there was always a "what if" factor. The other trajectory entailed manifestations of a teenager who grew up making things and reading magazines like Popular Mechanics and Popular Science. He was motivated to find ways to explain in simple artistic terms the most daunting concepts and phenomena. Looking at many works you wondered if they belonged in an art museum or a science fair. Examples of that approach were "The Frictionless Sled" 'The Speed of Light Machine" "C.B.T.V. 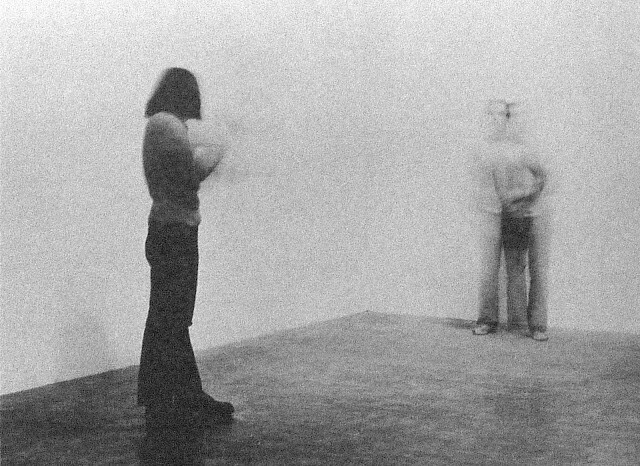 (Chris Burden Television)" and "B-Car Specifications." While demonstrating scientific concepts in a museum setting they were not compelling as fine arts objects. Unless, that is, you consider deadpan aesthetics in the Dada/ Fluxus tradition. That morning he proved to be more accessible and rational than I had anticipated. It was surprising to learn that he was born in Boston and grew up in Cambridge. That included discussing Buckingham Browne and Nichols School and several mutual acquaintances including his sister Lesley who died young. Apparently, he had pulled a knife on an interviewer as a "TV Hijack." So it was definitely pushing when I asked if I might see the scar from his "Shoot" piece. There was a moment of hesitation in which I feared for my life. Well, kindah. Then he quickly rolled up his sleeve to show me the slight scar. Typically, there were only a handful of essential individuals present for these ritual events. "I didn't send out press releases or invite the media" he explained that would create a circus-like atmosphere. "The idea was to stay calm. If anyone got nervous and messed up there could be serious injury. I just wanted to experience what it was like to get shot. I asked a trained marksman and the idea was to perhaps draw a single drop of blood." The result proved to be more than that. 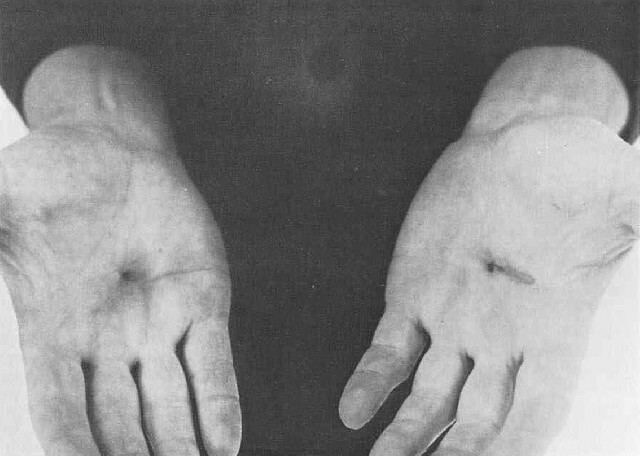 For the crucifixion piece he had himself nailed to a Volkswagen "Trans -Fixed" with a revving engine. .
Once nailed the garage door was opened and the car was briefly rolled out and back in. The result left the artist with stigmata but minus the wound to the side. That struck me as evoking a new interpretation of the saints and relics of the Roman Catholic religion. The performances were documented with film (pre-video) and photography as well as the artifacts either real or recreated. The ephemera of these events became their enduring museum aspect. Looking at this material in vitrines one tried to conjure the full impact of the actual ritual or event. Now ensconced in art history it is insightful to consider that only a handful of individuals actually experienced them. It is like the millions who claim that they were at Woodstock because they saw the movie. The work of Burden has morphed into the collective DNA of cutting edge contemporary art. Those who continue his kind of work, there are many, are mandated to be ever more absurdly outrageous to achieve even an increment of his enduring impact and originality. Burden also had a wonderful economy of means in finding affordable and recycled ways of clarifying seemingly unfathomable global issues and nightmares. To illustrate the extent of the threat of Armageddon with “The Reason for the Neutron Bomb” 50,000 nickels topped with 50,000 match heads and painstakingly laid out in a grid provided a visual equivalent of all of those missiles. That was in 1989 and who knows how many there are today? 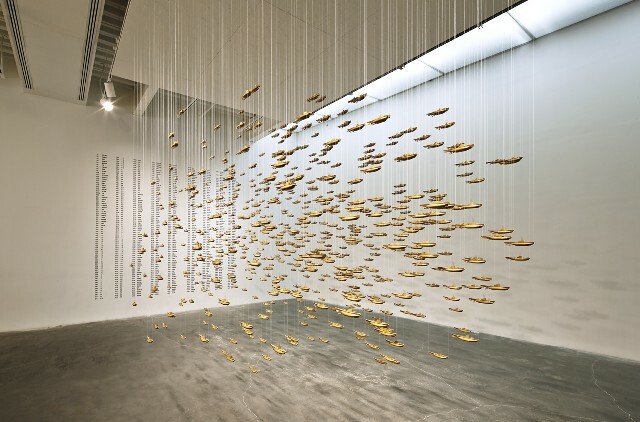 Another piece with hanging models calculated all of the nuclear submarines. He explained to me that he wrote a check, borrowed all those nickels, and after the piece they were cleaned, rolled and returned to the bank for a refund. On another occasion with armed guards he displayed "Tower of Power" a pyramid of 100 one kilo borrowed gold bars. In 1985 the artist's materials were valued at $1 million. As our conversation was concluding the guards were preparing to open the museum to the public. 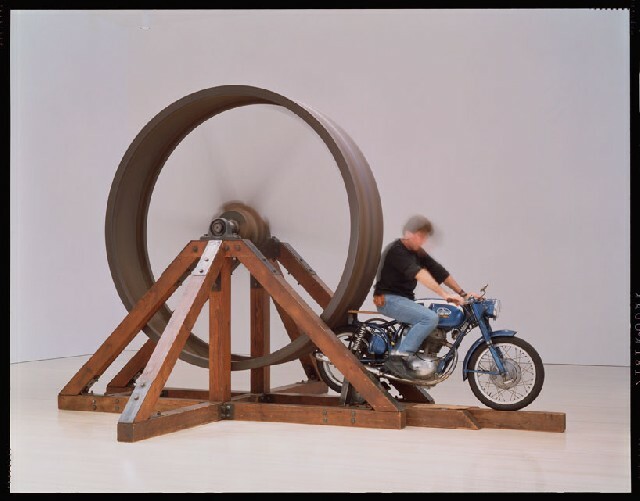 For "The Big Wheel" Chris mounted a motorcycle, revved the motor and backed it up to make contact with as 6,000 pound, cast iron flywheel some eight feet in diameter. Slowly the energy of the motorcycle made the huge wheel spin faster and faster. Eventually Chris disengaged and turned off the bike. With a roar the wheel was spinning for the rest of the day. This was repeated during the run of the exhibition. On many levels my head has been spinning ever since.